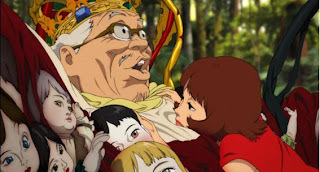 One of the wonderful gifts we received for Christmas--yes I'm still talking about stuff from three months ago--was a copy of Satoshi Kon's new film Paprika. His previous works include the disturbing Perfect Blue, the wonderful Millennium Actress, and the moving Tokyo Godfathers. 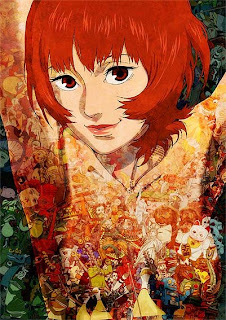 Yet in Paprika he takes on a different role by creating a film whose script is more fully based on a pre-existing story, by the same name, originally written by Yasutaka Tsutsui. 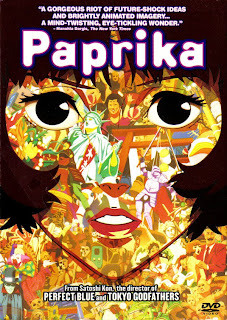 I probably don't need to get into the flawlessness of the animation in Paprika. The work really is quite exquisite, and serves as a testament to the high level of quality that anime has reached. The plot line is strong, though I wouldn't necessarily say that it was as powerful as Millennium Actress' perhaps. The whole thing has this sort of element of being a bit playful, even when things get serious. Paprika's character serves to keep it light with her, shall we say, spicy attitude? Bad puns aside, there is really never a strong sense that things are going to go awry, even when they are. In essence, the surreal nature of dream scenes within the film makes the whole experience feel a bit dream-like. You just never get your emotions wrapped up enough to get you riled up. It lacks the paranoia of Lain, and never gets as gut-wrenching as Evangelion, but that's not necessarily a bad thing. Niea_7 had one of the most mellow stories in anime history, and it was a refreshing and relaxing experience. Paprika doesn't quite go to that extreme of nonchalance, yet it remains light-hearted enough to have fulfilled its mission. That mission, in so far as I understand it, was to portray different realities based on our dreams, and then subject them to an intertwining roller-coaster ride. The result can be somewhat mind-numbing, expressed aptly by the character of Toratarō Shima while being dragged on that parade. Still, while Paprika manages to approach these various boundaries, and perhaps even nudge them a little, it never goes overboard. It remains a joy to behold, a visual feast continually surprising, and reels you in with traditionally Japanese melodies that have been synthesized and vocoded to yield some contemporary ear-candy. Satoshi Kon likes to play with the audience's perception of events and time-lines. That much has become obvious from his first Perfect Blue. In Paprika, he seems to have reached a superb level of finesse in this arena, while still keeping the viewer from being turned off. So what does all of this amount to? Well if you haven't guessed it by now, it amounts to the fact that you have got to see Paprika. And then go see the rest of his films!